Sharon & John welcome you to Hervey Bay's only multi-award winning AAA rated four & half star Bed & Breakfast located just minutes from the Beach, Urangan Pier, Botanical Gardens, Restaurants, Shops & Clubs. Fraser Coast South Burnett Regional Tourism Award for Excellence Winner - Best Hosted Accommodation 2009 & 2010. Fraser Coast Business Awards Multi Award Winner 2010 - Business of the Year - Tourism Award - Micro Business Award. 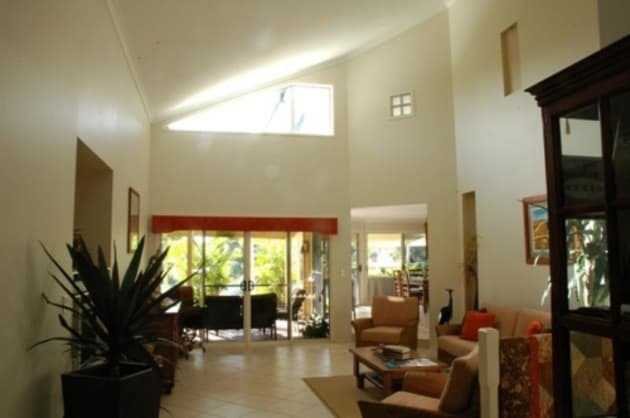 Alexander Lakeside Bed and Breakfast Hervey Bay is a modern purpose built luxury home peacefully surrounded by a wildlife lake it is Hervey Bay's Lakeside Sanctuary. The ultimate retreat accommodation for those wanting a little piece of home when on holidays. 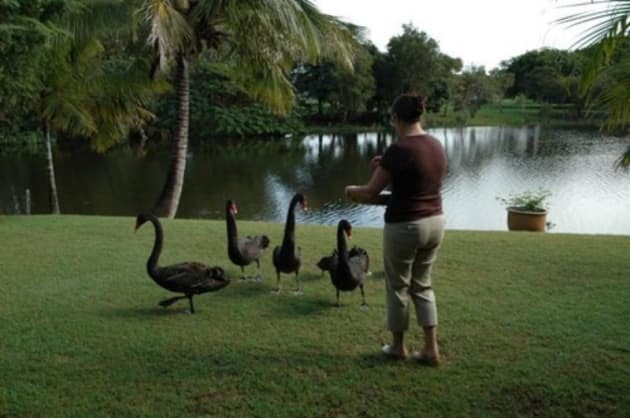 Start the morning with a hot tropical breakfast overlooking the lake then participate in our turtle feeding as you watch the abundant bird life. 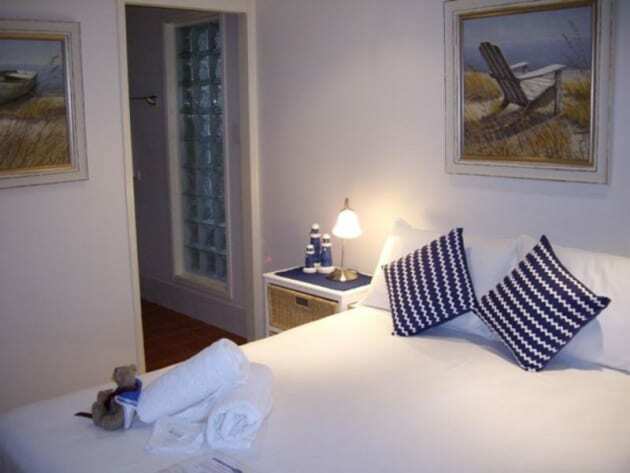 We have beautiful accommodation with two luxuriously appointed rooms & two luxury self-contained suites. All with private ensuite bathrooms. Other guest facilities include wireless internet, fax, push bikes, BBQ, laundry facilities, solar heated lakeside spa (closed in winter),dining & lounge with full entertainment system, outdoor dining & lounge, all overlooking the lake. Fraser Coast Airport is only 6 kilometres away & has flights direct from Sydney and Brisbane. Hervey Bay has beautiful beaches and calm stinger-free waters. 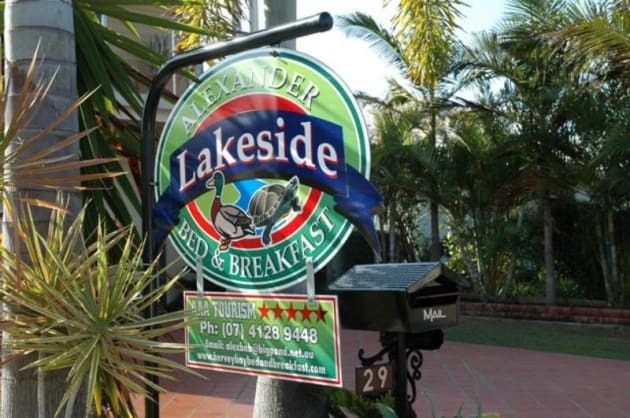 Alexander Lakeside Bed & Breakfast can take the hassle out of your holiday & book tours for you at no extra cost, with the convenience of being picked up & dropped off at our door. Just phone or email & we will assist you. It will be a pleasure to share our home. lifestyle & gardens with you.